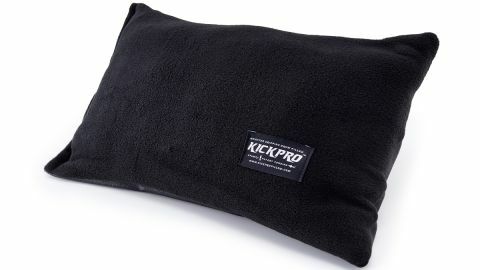 Not just another bass drum pillow, the Kickpro really does what it says on the tin, meaning a fat bass drum tone in an instant with no need for straps or velcro. Does its job incredibly well. More expensive than an old jumper! Unquestionably up there as one of the most (if not the most) important parts of our kit, getting a quality bass drum sound is paramount whether playing live or in the studio. Obligatory towels and jumpers aside, there are a plethora of products on the market designed to help us achieve our perfect sound. Having already worked with bands like Deftones, Foo Fighters and Queens Of The Stone Age, KickPro's developer Jon Nicholson certainly knows a bit about getting it right both live and in the studio, and his bass drum pillow aims to help you do just that. The 17"x10" pillow has a soft fleece material on the top which is designed to essentially pre-EQ the sound, soaking up those unwanted frequencies. The underside has a coarse rubber coating which keeps it firmly in place whilst playing. With more potential graphic options on the horizon, the only other finish currently besides black is the truly bizarre 'Fried Chicken' print, which is basically illustrations of buckets of chicken and the like. Extraordinary. The dense weight and grippy design of the pillow allows it to be used without need for any velcro or straps that many dampening alternatives may require. The idea is that not only will it stay exactly where it is placed but it can also be easily moved with zero fuss. In practice the pillow did exactly as it promised. The ability to basically chuck it against either head without even putting it inside the drum is amazingly time-saving. Even in this position the pillow adds punch and a low-end thump to an already hefty sounding bass drum. The KickPro should fit through a standard 5" hole with no problem but it's worth noting that it was quite a struggle trying to get it through a regular Kick Port. However, with the resonant head off, we were free to position the pillow inside the drum. When inside the drum there are a multitude of placement options, each with its own tonal characteristic. It manages to transform the note of the drum without killing off any of the tone.